A society formed in the United States for "the dissemination of knowledge of the Jewish religion by fostering the study of its history and literature,giving popular courses of instruction, issuing publications, establishing reading-circles, holding general assemblies, and by such other means as may from time to time be found necessary and proper." Its organization was the result of a suggestion offered by Rev. Dr. Henry Berkowitz in an address before his congregation, the Rodeph Shalom, Philadelphia, March 10, 1893. The Jewish literary societies of that city appointed a "committee on organization," which formulated plans. 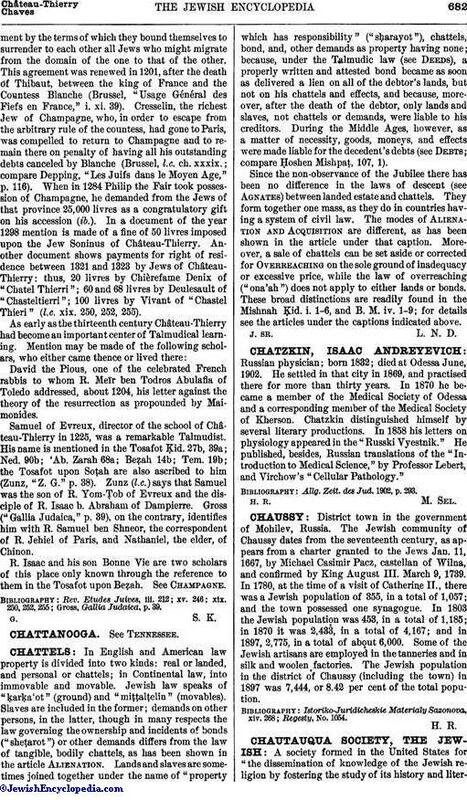 An agreement was entered into with the Chautauqua Literary and Scientific Circle convened at Lake Chautauqua, N. Y., for the use of the general methods of popular education known as the "Chautauqua System." A Jewish society, national in its scope, was then organized, with Dr. Berkowitz as chancellor. In the winter of 1893 the society began the publication of a series of "course books" or syllabi for general readers and members of reading-circles or study classes. These guide-books give syllabi of courses in Biblical and post-Biblical history and literature, in the Hebrew language (correspondence method), and on Jewish characters in fiction. 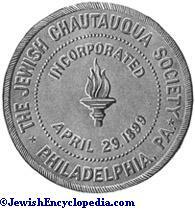 Seal of the Jewish Chautauqua Society. The society has succeeded in interesting several thousand persons in the United States and some in Great Britain, Canada, and British India, in pursuing the readings outlined. By correspondence and through the agency of a traveling field-secretary, numerous Chautauqua circles have been organized in many communities. 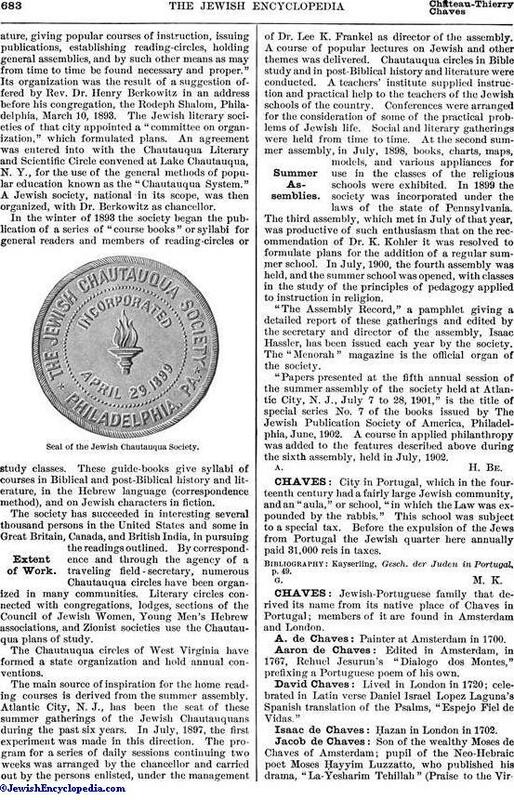 Literary circles connected with congregations, lodges, sections of the Council of Jewish Women, Young Men's Hebrew associations, and Zionist societies use the Chautauqua plans of study. The Chautauqua circles of West Virginia have formed a state organization and hold annual conventions. The main source of inspiration for the home reading courses is derived from the summer assembly. Atlantic City, N. J., has been the seat of these summer gatherings of the Jewish Chautauquans during the past six years. In July, 1897, the first experiment was made in this direction. The program for a series of daily sessions continuing two weeks was arranged by the chancellor and carried out by the persons enlisted, under the management of Dr. Lee K. Frankel as director of the assembly. A course of popular lectures on Jewish and other themes was delivered. Chautauqua circles in Bible study and in post-Biblical history and literature were conducted. A teachers' institute supplied instruction and practical help to the teachers of the Jewish schools of the country. Conferences were arranged for the consideration of some of the practical problems of Jewish life. Social and literary gatherings were held from time to time. At the second summer assembly, in July, 1898, books, charts, maps, models, and various appliances for use in the classes of the religious schools were exhibited. In 1899 the society was incorporated under the laws of the state of Pennsylvania. The third assembly, which met in July of that year, was productive of such enthusiasm that on the recommendation of Dr. K. Kohler it was resolved to formulate plans for the addition of a regular summer school. In July, 1900, the fourth assembly was held, and the summer school was opened, with classes in the study of the principles of pedagogy applied to instruction in religion. "The Assembly Record," a pamphlet giving a detailed report of these gatherings and edited by the secretary and director of the assembly, Isaac Hassler, has been issued each year by the society. The "Menorah" magazine is the official organ of the society. "Papers presented at the fifth annual session of the summer assembly of the society held at Atlantic City, N. J., July 7 to 28, 1901," is the title of special series No. 7 of the books issued by The Jewish Publication Society of America, Philadelphia, June, 1902. A course in applied philanthropy was added to the features described above during the sixth assembly, held in July, 1902.